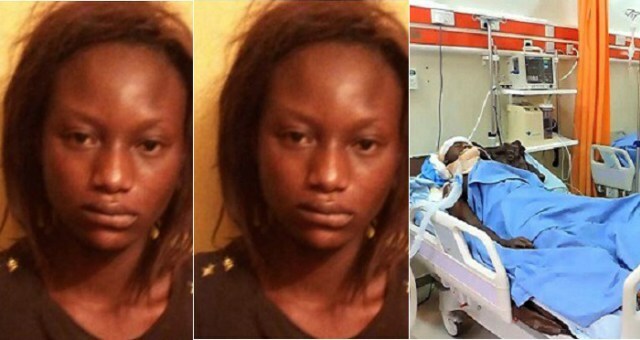 The young woman – the housemaid who beat her boss to coma has now been identified as Susan Samson – an indigene of Cross River State. PUNCH Metro learnt that Mistura had been in a coma since Monday, March 5, 2018, when she was attacked with blended pepper and a wine bottle by the maid, identified as Susan Samson. Our correspondent was told that despite a three-hour surgery on Wednesday, the victim had yet to come round and was in the intensive care unit of LASUTH. After the stolen money was recovered from Samson’s bag, Mistura was said to have alerted the agent who brought her. The suspect was reportedly apprehended by residents who heard the victim’s scream for help. PUNCH Metro was told that the suspect was handed over to policemen from the Ejigbo division. A source told PUNCH Metro that the couple had a disagreement late 2017 over the issue of getting a maid as the husband was against the idea.